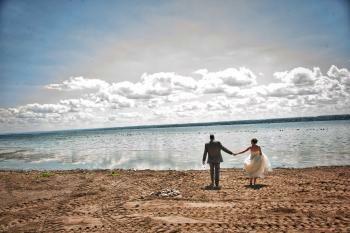 It’s wedding season, and the Finger Lakes has become a destination for many couples who will be tying the knot. In fact, the cover story for the April issue of Rochester Magazine says the past decade has been full of a lot more “I do’s” in the Finger Lakes by couples who traveled as far as California, Arizona Oklahoma and Florida. Even destination wedding central, Hawaii, has sent us brides and grooms who opted for gentle lakes over tropical lava as the backdrop for their special day. There are so many picture-pretty spots in Ontario County for nuptial photos that I could never list them all here. But I was curious about the more unusual locales, so I checked in with two Ontario County photographers, Jan Regan and Steve Chesler, for their suggestions. So many couples want their picture by a lake, says Regan, of Geneva. Ontario County shares shoreline with five of the 11 Finger Lakes (Canandaigua, Seneca, Honeoye, Canadice and Hemlock), so there are a lot of choices. While a professional photographer will keep lighting, composure and other details in mind, Regan says it helps to have other elements besides water included in the composition. One of Regan’s favorite spots to take wedding pictures is the benches along State Route 14 in Geneva. The spot overlooks the north end of Seneca Lake with some nice trees and a gentle slope in between. The public benches are often where pedestrians, cyclists and city residents on a stroll will simple stop and admire the area’s natural beauty. I think of it as an everyday place that is extraordinarily special. While the Finger Lakes region is famous for its bucolic scenery, Regan also likes to go for locations with more of an urban feel. The Cracker Factory, a renovated industrial building in Geneva that has become a center for cultural and arts events, has become an especially popular wedding location in recent years, she says, offering exposed stone and brick. “I love the pictures there,” she says. 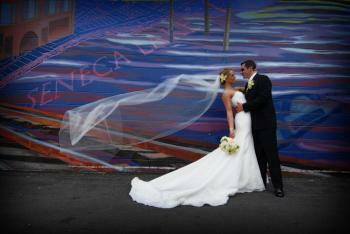 Canandaigua&apos;s Chesler is also a fan of the Finger Lakes urban look, and has posed many couples in front of the murals that pop up in surprising places in downtown Geneva. These might be the “Seneca 64” mural by Geneva-born painter Ken Millington, done in 2010, which depicts the evolution of culture and industry along Seneca Lake. Or stretching back further in time, “An Autumn Scene” at the Geneva Post Office done by Peter Blume in 1941. Both are quintessential cultural icons in Geneva. For wedding parties who are willing to walk a little bit (and perhaps get their feet wet), Flint Creek in Seneca Castle is one of Chesler’s favorite spots. He has also worked with couples who are willing to hike into Grimes Glen in Naples, wade in Grimes Creek and get one of the Glen’s several breathtaking waterfalls as the backdrop. “I’ve even been at ‘trash the dress’ sessions after the ceremony, where the dress ends up floating in the water,” he laughs. The important thing is to let the bridal party have fun and let the photographer worry about the logistics, Chesler says. And don’t worry about the time of year. No matter when you tie the knot, there is a gorgeous backdrop for your pictures here in Ontario County.